Bult Field (C56), a corporate/general aviation airport in northeastern Illinois, is protecting the pilots and aircraft that use its 5,000-foot runway by deploying drones to keep wildlife away from the airfield. The tech-forward program is a follow-up/complementary measure to a wildlife assessment conducted by the U.S. Department of Agriculture and the Illinois Department of Transportation-Division of Aeronautics, which owns and operates the airport. "We are always looking for ways to improve safety, enhance operational efficiency and improve the pilot experience at Bult Field and other airports," says William Viste, project coordinator, Illinois Aeronautics Division. "UAS (unmanned aircraft systems), or drones, can limit the need for staff to traverse certain terrain and hard-to-reach areas. Airports can reach over several hundred acres, so drones provide a unique and cost-effective way to assess areas of this size. In addition, specialized sensors, such as thermal imaging, can produce information that is not as easily gathered from the ground." For many airports, drones are nothing more than an airfield hazard or nuisance. At Bult Field, they are literally taking wildlife management to new heights. Specifically, unmanned aircraft are helping drive deer, coyotes and foxes off active airport areas and birds such as raptors, gulls, geese and starlings out of aircraft flightpaths. The airport has partnered on the project with Hanson Professional Services, an aviation engineering and planning consulting firm also based in Illinois, since last fall. Hanson focused on finding a way to use drones for wildlife management that didn't add to the full plate already in front of airport managers. In addition to handling leases and rents, airfield maintenance and aircraft fueling, managers at some small airports also have to jump in vehicles to chase animals off the runways, notes Rodger H. Anderson, an environmental specialist with Hanson. "We used high-tech GPS technology to set up a preflight situation where the unmanned aircraft systems will fly a course we programmed into it," he explains. 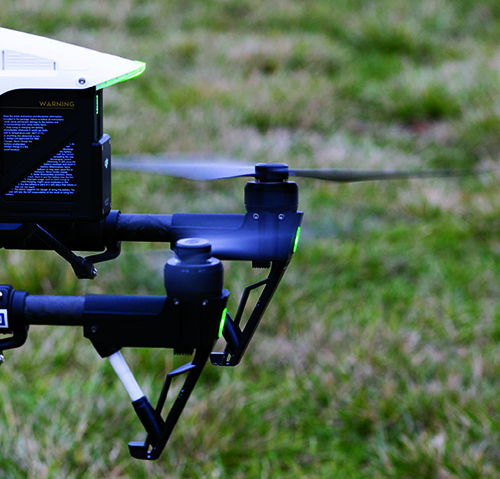 The drones consequently fly the same course every time, and GPS technology largely automates the flights. The drones are also equipped with infrared technology to detect thermal images of wildlife near the airfield. The infrared technology helps the project team determine exactly what type of animal is out there by its size and how it moves or runs. "It allows the airport manager to monitor and identify any immediate hazards that might become an obstacle to an aircraft upon landing or take off," says Anderson. "And we're actually able to zero in on that deer, coyote or bird, and use ultra-high frequency noise that humans cannot hear to encourage them to leave the area." In order to program the drone flightpaths, Hanson inspected and analyzed Bult's airport operations areas to identify locations where aircraft could potentially run over an animal or ingest it into their engines. Hanson personnel also focused on the approach and departure areas off the ends of the runways. "These areas combined become a critical zone, and that critical zone becomes the perimeter that the UAS is programmed to fly," Anderson says. "Every airport has its own course that the UAS would fly based on how it's set up." At Bult Field, drone flights typically take place once a week, but are more frequent during seasons when animals are more likely to aggregate, become more assertive in their movements or grow in numbers. "Right now, most airports function with UAS or other means of wildlife control on an as-needed basis," says Anderson. "UAS provide airport managers with a non-lethal means of controlling wildlife," he adds, noting that in general, wildlife management often puts them between a rock and hard place for public relations. "While safety is of utmost importance on the airfield, the last thing an airport manager wants is the nightly news reporting that the airport lethally removed 15 deer because they got inside the fence." Beyond using drones to drive wildlife away from the airfield, Bult also uses the technology to identify movement patterns, nesting/bedding areas and other elements that are not as easy to see from the ground, particularly in areas that are difficult to reach on foot. Aerial mapping secured by drones shows where animals are aggregating, where their trails and gathering areas are, and when they are moving through those areas, explains Anderson. "This information is put into a GIS database so that we can start to see patterns and predict from year to year what can be expected," he says. For example, the project team might learn that red-winged blackbirds gather in one particular area of the airport during late spring and early winter. Or, it could discover that in the summertime, birds run through an end of the runway and geese nest in a field near the taxiway. "We can focus our attention in those areas at those times," Anderson remarks. "We could bring the UAS out once a week, or in large airports, daily. Then it becomes more than just monitoring and immediate threat detection and moves into deterrence." As the technology evolves, Viste foresees even more applications for unmanned aircraft at airports. "Drones can be valuable tools in many capacities from survey/mapping, infrastructure inspections, emergency response and visual assessments," he says. "However, operators must remain mindful of the FAA rules and regulations governing UAS use, particularly when operating on or near airports. Operational safety is always the primary concern, so UAS pilots and support crews must be properly trained to understand the high level of aviation skill and knowledge to operate safely and efficiently." 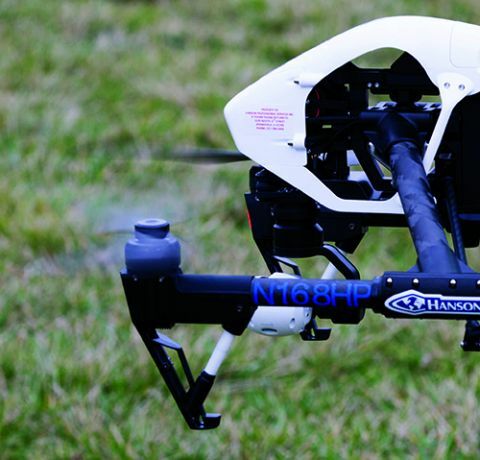 Hanson brings in FAA-certified pilots to perform all of its drone flights. The pilots also have spotters to help them monitor other aircraft in the area. "The pilot makes sure the UAS operates where it should, and the spotter makes sure the airspace is clear," comments Anderson. "And sometimes, there are others involved who, via radio communication, let the operator know when animals are in proximity and need to be pushed away." Viste emphasizes that drones are just one element in Bult's overall wildlife management strategy. The airport focuses on training staff to recognize which particular method is appropriate in various circumstances, he adds. Anderson, who has studied animal behavior and worked as an environmental specialist with Hanson for about 20 years, notes that airports have been attuned to wildlife management long before the famed U.S. Airways flight piloted by "Sully" Sullenberger propelled the topic of bird strikes into the mainstream. Ever since, FAA has stepped up its efforts help airports become more uniform in how they manage wildlife, he notes. The methods being used have consequently evolved-especially in the Midwest, observes Anderson. "In Illinois, for example, there is quite a bit of agricultural land and wildlife preserves surrounding the airports, where the wildlife flourish," he explains. "The animals see no boundaries between that land and the airport itself." These airports work with environmental specialists such as Anderson to manage stormwater and ponds, move agricultural crops farther away from active airport areas, maintain grassy fields, install fencing and implement noise deterrents to keep animals off taxiways or runways when aircraft are landing or taking off. Unmanned aircraft are simply a new high-tech tool used for the same purpose. Like other methods, drones should not be overused, he cautions. "There comes a time when animals just do not respond to deterrents or keep coming back," explains Anderson. "And at those times, more extreme methods may be necessary for safety reasons." 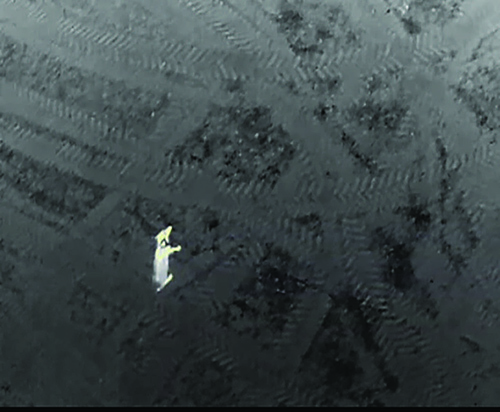 With its drone operations, Hanson strives to find the "sweet spot," where animals do not grow accustomed to unmanned aircraft and the high-frequency noise they deliver. "We think it's effective because of the airborne trajectory it's coming from," explains Anderson. "It moves, and they don't understand that so far. "We have seen a different response by the same wildlife when they see a van or truck coming into the areas with the lights on and the horn honking," he adds. "They just kind of flutter up and land 50 yards away." When vehicles do not work, airport workers add screamers and bangers, which are essentially bottle rockets and other fireworks. "But some animals get used to these as well," Anderson adds. When pyrotechnics fail, airports often bring in canine teams to harass the animals and scare them away. "But canines can sometimes get confused and cross runways or become an issue with oncoming aircraft," he notes. In contrast, drones are controlled by operators on the ground, who can quickly set them down or avoid active airspace when needed. If an operator somehow loses communication with Hanson's device, it has redundancy built in to slowly set itself down, out of harm's way. Given these advantages, Hanson considers drones to be the best new wildlife management tool in an airport's toolbox, notes Anderson.